What's your fashion attitude? Big brim with lots of trimmings or simple and chic? 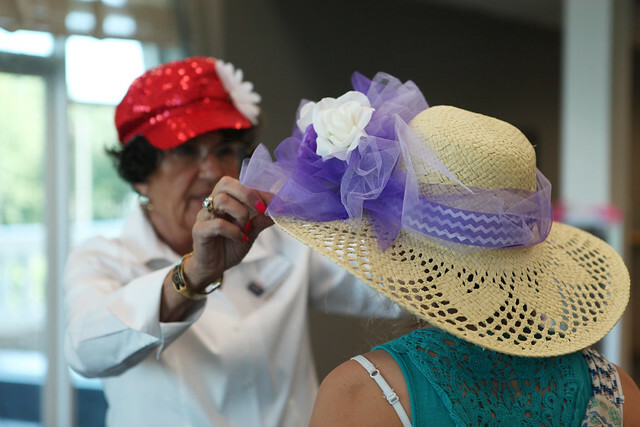 During Hatitude, groups will create their very own personally designed Kentucky Derby hat or fascinator. We provide a range of hat styles for men and women... big brimmed hats, small brimmed hats, fedoras, cowboys hats, fascinators, and more. We also provide ribbons, bows, flowers, feathers, staff assistance and all the fanfare - you provide the style! Reserve this group activity today and flex your Hatitude.